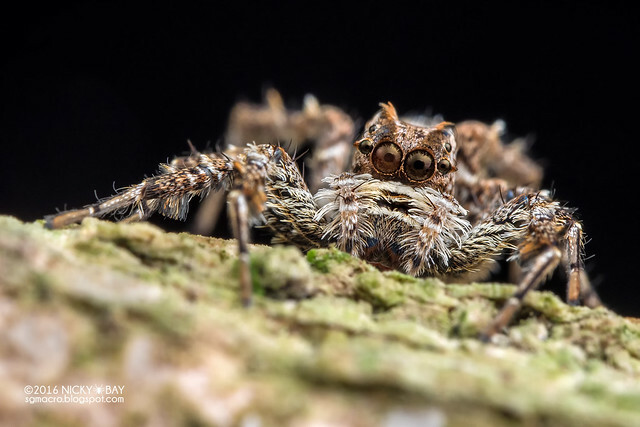 Last year, Olympus Singapore loaned me a pre-launch unit of their new STF-8 Macro Twin Flash, together with their OMD-EM1 Mk1 and M.Zuiko Digital ED 60mm f/2.8 Macro for a test-run in the field. I've had the set for about a week -- it was easy to use and the results were pretty good, although it took some time for me to get used to focusing using the LCD. 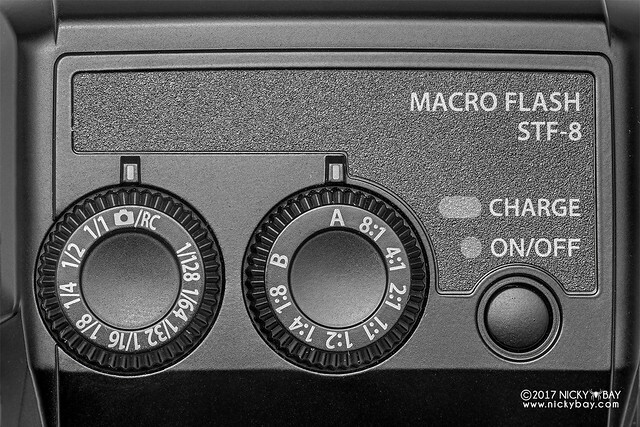 This review is grossly overdue, but I'm posting it because I had been receiving questions on macro photography performance on micro four-third systems. This not a technical review. Instead, I will explain its pros and cons, as well as simple steps to maximise its capabilities. 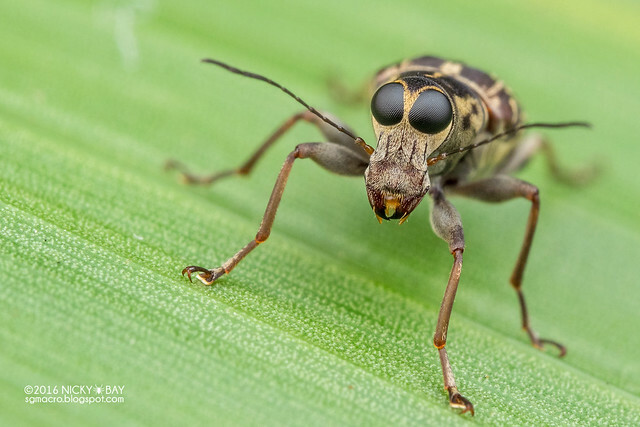 Most major camera brands produce twin-flash systems for macro photography, but many macro photographers are still able to get great results with just a single flash. So... what's the use of a twin flash then? Here are some of the minute differences. Even with elaborate diffusion, single flash systems would have difficulty filling the shadows underneath the subjects -- especially those with broad bodies. In twin flashes, the light usually approaches the subject from the side, which leads to much softer shadows. With the light source from 2 different spots, the light is naturally more distributed, as opposed to having it from a single spot. Most twin flash systems allow the individual flashes to be detached, so that they can be placed at odd angles or even behind the subject. A great convenience! 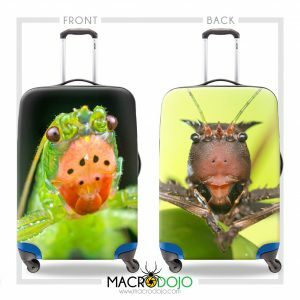 I have used most of the macro twin flash systems in the field before, so here's a quick overview of the differences that a macro photographer should know of. Note that for Nikon SB-R200, they can only be triggered wirelessly by the onboard flash of some Nikon camera bodies, or with the Nikon SU-800. 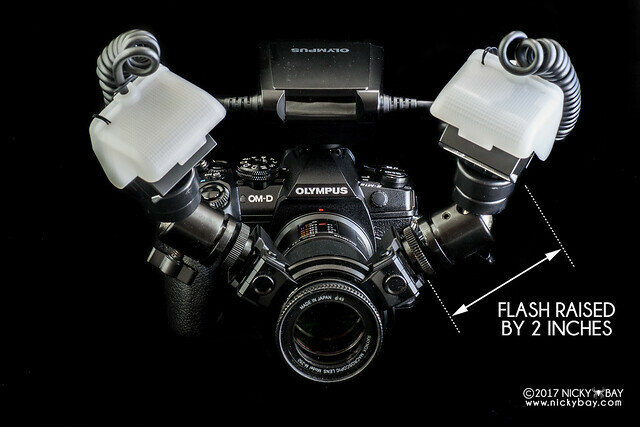 Specifications above are for each flash unit excluding any mounts or arms, and more than 2 units can be used together. It is also worth noting that Yongnuo has recently launched a Canon MT-24EX knock-off -- the Yongnuo YN-24EX. Looks identical but at just 20% of the original's price! Several users had reported a higher failure rate of this flash, but it is still worth checking it out. Last but not least, Venus Optics is having a promotion this month (June 2017) for their lenses and the Kuangren KX-800. 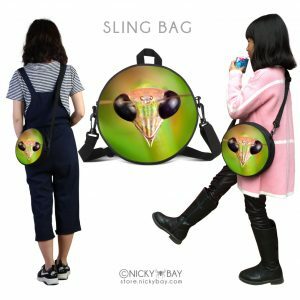 Check out the promotion details here. Most of the above twin-flash systems come with a custom ring attached to the front of the lens to mount the flashes. 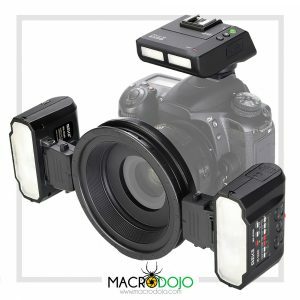 They are really convenient, but the problem arises when the flashes are mounted too close to the subjects, with little space in between to insert any effective light diffusion. This means that the ring that comes with Nikon's R1 or R1C1 should never be used since they use custom mounts. The rings for Canon and Olympus have cold-shoe mounts, so that allows us to extend the height of the flash and distance it further away from the subject for better light diffusion. 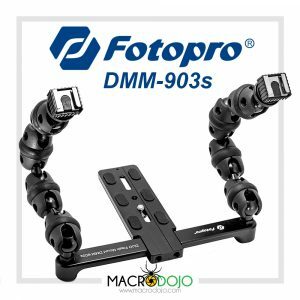 To work around this issue, many macro photographers use flexible arms to mount the flashes. There are several options available, but that'll be another topic altogether. 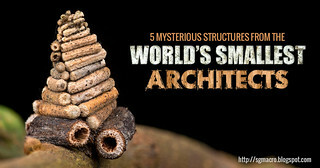 Check out my macro equipment page for details on what I'm using. 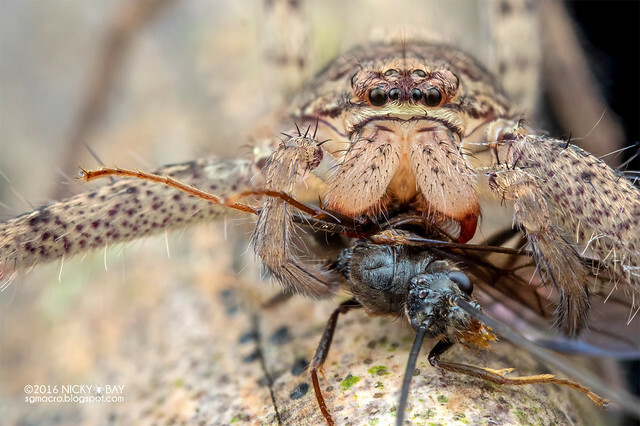 For the photos in this post using the Olympus STF-8, I have installed tiny flash ballheads at the base of each flash so that they are at least 2 inches further away from the diffuser. It results in really soft and pleasing highlights on the subject. Dial controls allows the power ratio of each flash to be set quickly without running through complex menus. Unfortunately they are not illuminated so it might be tough to change settings in the darkness. Note: The photos above show the latest OMD-EM1 Mk2, but the sample photos below were taken with the OMD-EM1 Mk1. The default diffuser caps were not used. As I had the system for just a week, I made 2 short hikes to Durian Loop and Zhenghua Park in Singapore to try the system out. I have a lot more photos, but these stood out and showcases the benefits of a twin-flash system. All photographs in this series were taken with the OMD-EM1 Mk1 with M.Zuiko Digital ED 60mm f/2.8 Macro and Raynox DCR-250, lighted with the STF-8 Macro Twin Flash and diffused with a DIY diffuser. 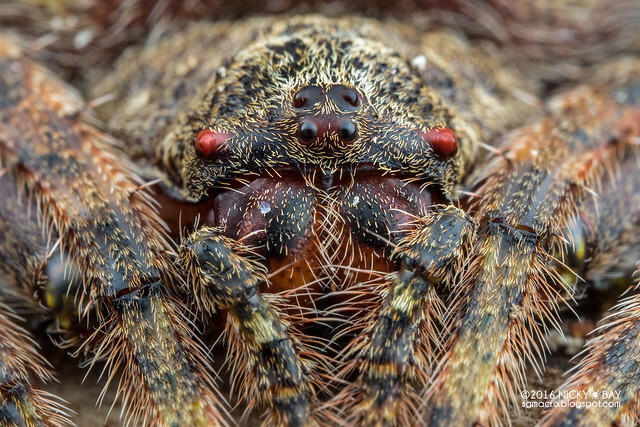 I photographed many huntsman spiders with this system. The lighting was obviously soft, thanks to Victor's diffuser. =D Also, the dual highlights appeared softer because they were elevated with the mini ballheads away from the diffuser. 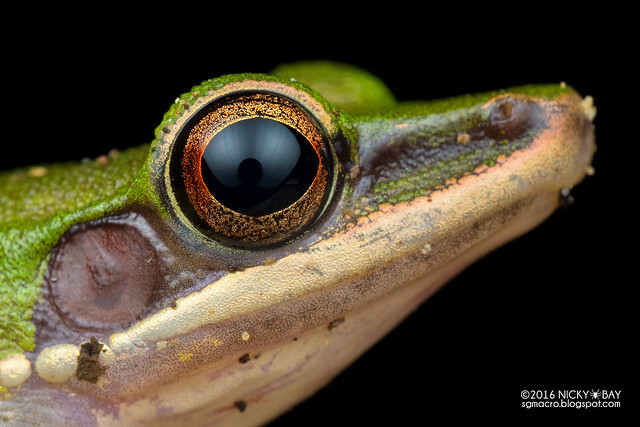 Consistently smooth lighting can be seen in the reflection on the eyes. Even the areas under the legs were lighted up sufficiently. 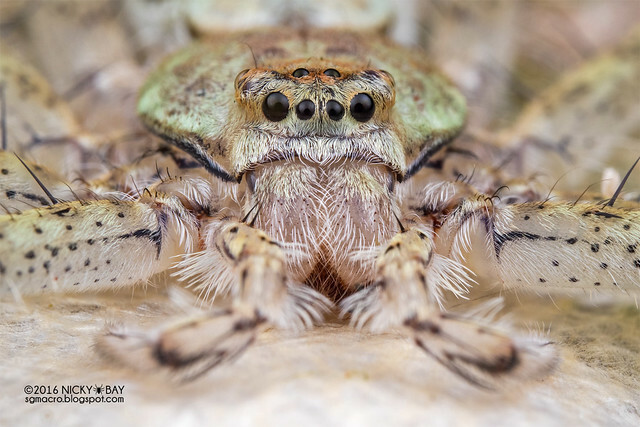 Did I mention that I photographed a lot of huntsman spiders? Very common huntsman found on tree trunks. The white hairs would've been over-exposed in most poorly diffused systems. 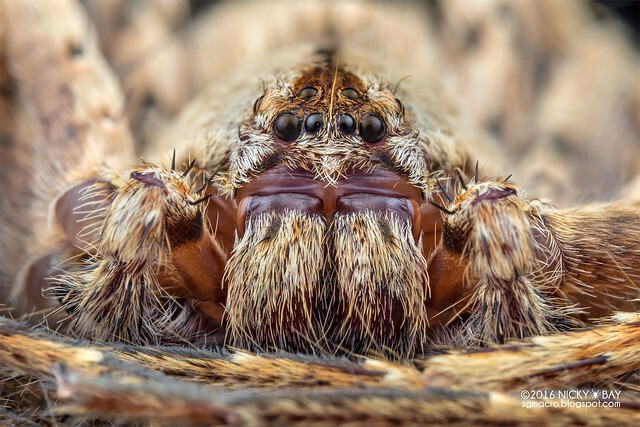 Even in orb weavers, there was no loss of detail in the hairs. This is largely contributed by good light diffusion, and partly by the camera sensor. 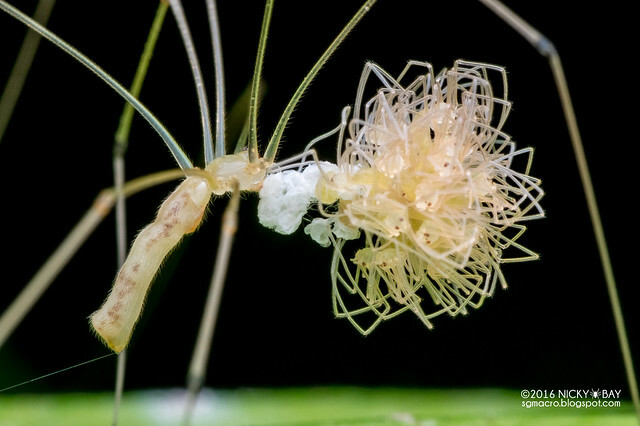 These little daddy-long-legs spiders have just hatched, and would have been perfect for back-lighting, but I wasn't too accustomed to this system yet. 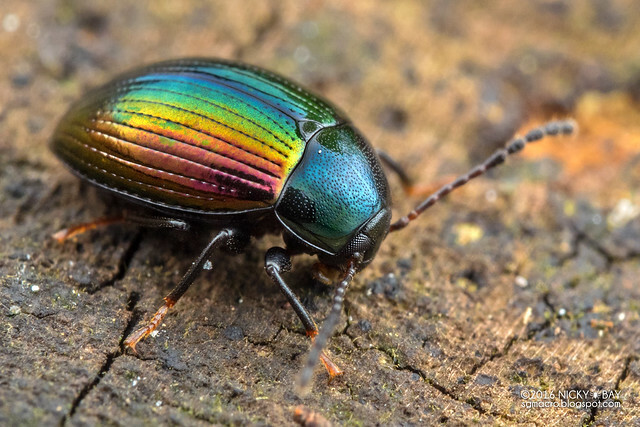 Highly reflective beetles like this would be great for testing out your light diffusion. 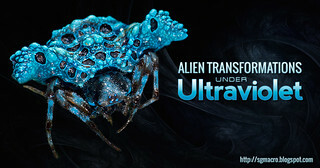 I ensured that the entire subject was covered by the diffuser to eliminate the dark areas on its body. 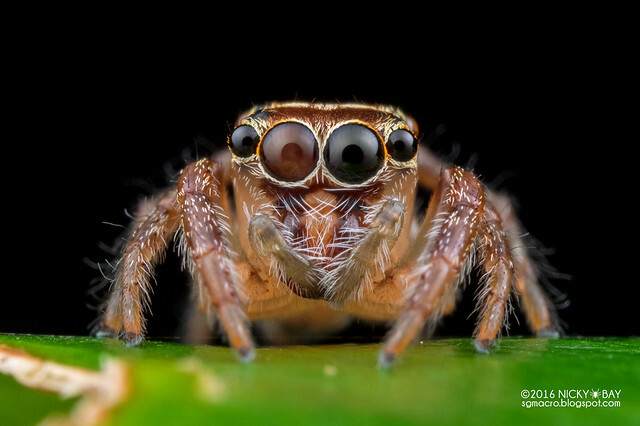 The reflection on the eyes of jumping spiders are perfect for checking the light distribution on the diffuser. Faint highlights can be observed in the eyes. Shadows were almost completely eliminated in this fungus weevil shot due to the light from both sides. 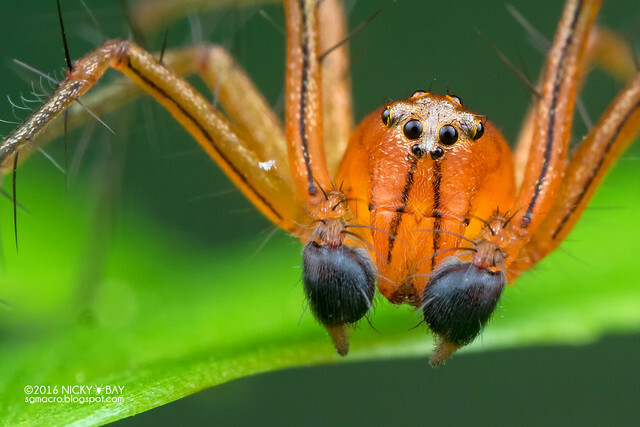 The colours on this male lynx spider were also brilliantly reproduced with the even lighting. 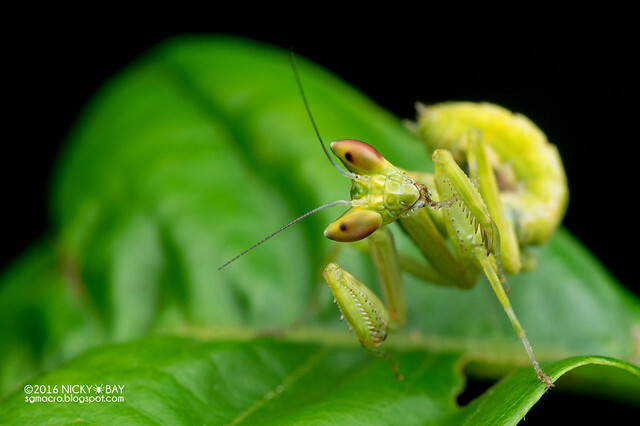 A curious mantis nymph caught grooming and arching its head. Again, minimal shadows spotted. 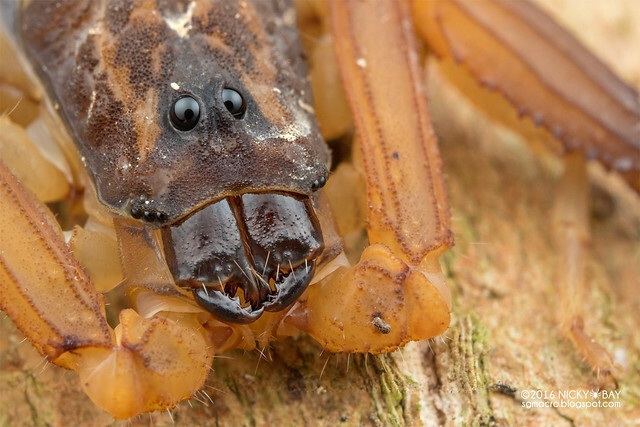 Close up on a bark scorpion. 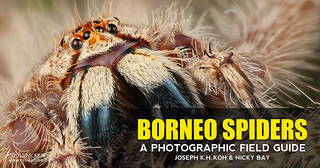 For close-ups of subjects on a flat surface like tree trunks, some single flash systems may have difficulty filling the shadows. A dual flash would help alleviate such a problem. 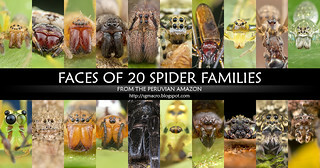 We found a pair of Portia spiders on the same tree! 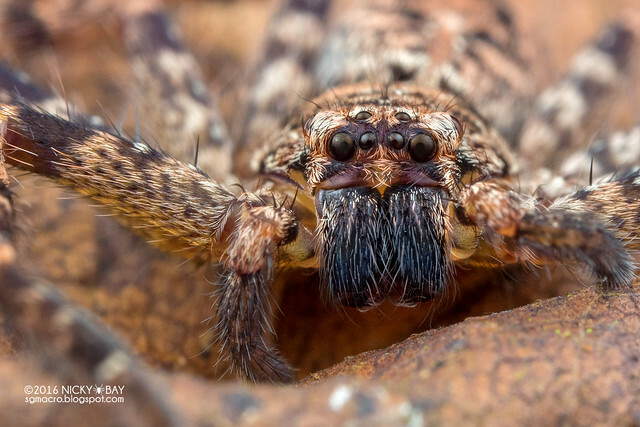 It was difficult to expose this shot properly without over-exposing the "moustache" but it turned out ok. 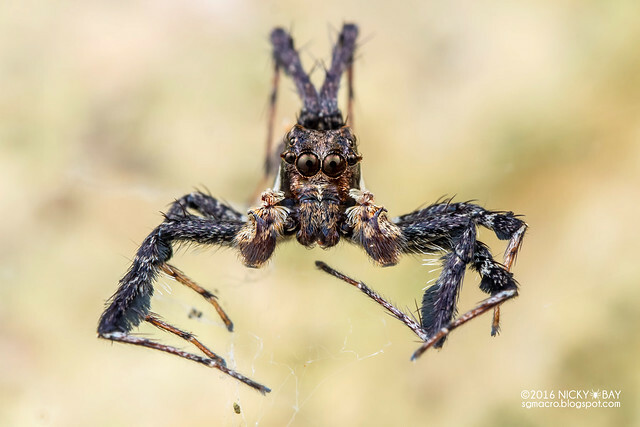 The male Portia was hanging out in a web. Not sure if the web belonged to another spider. 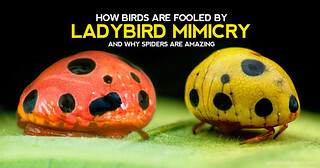 Finally, a large eye to test my diffusion on! 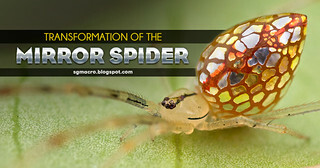 The shape of the diffuser can be seen in the highlights due to the larger eye. These technical specifications were taken from Olympus. 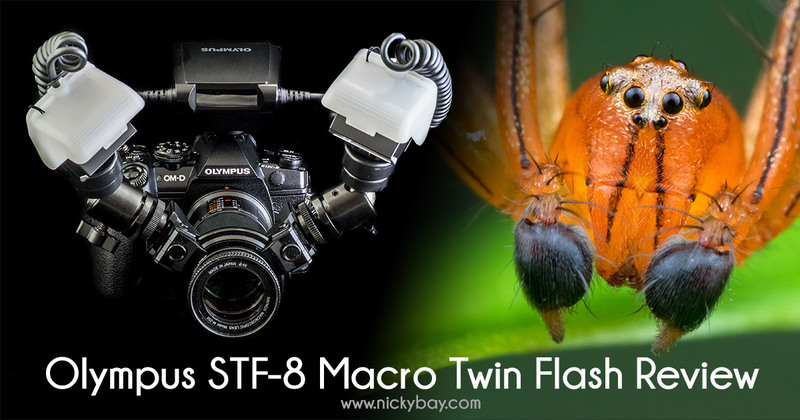 The Olympus STF-8 Macro Twin Flash is the first macro twin-flash system for micro four-thirds (M4/3) systems, and looks like a mini Canon MT-24EX. Its key selling point is its compactness and light weight, which is in line with what we expect of M4/3 systems. It is also splash-proof to lessen your worry in wet conditions. I only wish that it had a higher guide number which would be helpful for larger subjects. The default cap diffusers are definitely insufficient. A DIY concave diffuser needs to be built onto the tip of the lens, and the twin flashes need to be raised above its default mounts. 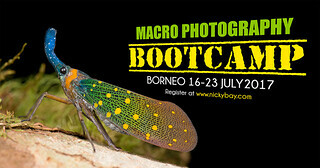 With that, you can be confident of well diffused lighting in your macro photographs. Thanks to Olympus for the loan set, and Victor Cheah for facilitating the loan! 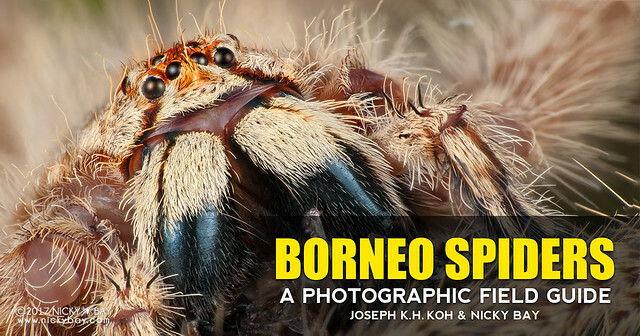 If you like my macro photographs, consider joining the next macro photography workshop in Borneo Bootcamp 2017 and I'll promise you an unforgettable adventure in the heart of Borneo with LOTS of bugs and spiders.